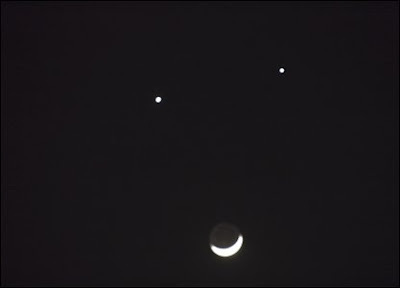 Last night, a Venus-Jupiter conjunction over Bangkok turned the night sky into a smiley face. On my radio show, I played the lullaby from my Pridi Symphony and scenes from Rigoletto, plus a scandalous rap song composed by Bruce Gaston. I only realized as it was playing how subversive the song was even after a twenty-year interval. I now read in the paper that the anti-government protests are winding down now, and that the future looks brighter in some ways. Whether this is a consequence of the smiling moon, I know not. I also read the following in the paper: "After the search, police found many weapons together with narcotics such as weeds and cough syrups. " What an astonishing combination of illiteracy and puritanism! For a moment, I almost thought I was back in America, in the dark times of Dan Quayle's potatoe. I've not encountered any widows wearing narcotics in a while, but I assume that with hemp-based cloth, such mourning might be possible.